So today we all got up at about 6am, had breakfast at 6:30am, signed out by 7am and got in a taxi half an hour later. From there we went straight to Sanur where we would get a boat to Nusa Lembongan. We got to Sanur by 8:30am, and fortunately only had to wait half an hour before we were on the fast boat to Lembongan. It was about a 40 minute trip, which was very pleasant due to completely flat and glassy seas. Having skirted the cliffs on the way in and landed on the beach in the main bay, it was just as beautiful as I remembered it, and it was great to be back! We as we got all our bags onto the sand a guy turned up and offered to help us get accomadation. Leaving the kit with the parents on the beach, I went on the back of the scooter with a bloke up to what was my favourite restaurant last time. Unfortunately I hadnt realised their rooms were still being built, so we stayed at a nice traditional style place next door instead. I got a boat with a local guy down the bay to collect Mum and Dad, then we came and signed it. By this time it was about half 10, so we chilled and just spent a few hours reading our books and lounging around until lunch. Having eaten we decided to go and see the Mangroves, and explore a little for the afternoon. I managed something I wasn't sure was possible - getting Mum (and Dad) on scooters! We got our stuff together and headed up to the top of the island during a very hot day, Mum on my scooter and Dad driving his own. It didn't take long to get up there, park up and be assigned a local guy as our guide. Soon enough we had hopped in his punting boat, and away we went. He turned out to be a much much better guide that I had last time. He was much more informative telling us all about the animals (or lack of) and answering our constant questions. At the end he also showed us the Seaweed growing/processing stuff, as he was actually a farmer who showed tourists around to desperately earn some more money. The process was pretty interesting; picking it once a month (150kg a time), drying it for 5/7 days in the sun, selling it for food/cosmetics etc for $4.50 a Kg. Without being able to make money showing people like us around, he probably lives and feeds his family of wife+2 kids on $50 a month..
From the mangroves we continued on the scooters, and actually did a loop around most of the island. We went past the bridge to the other island, round the middle and then down the steep hill, past the lookout down into the bay. We got back just as it was threatening to start a thunderstorm. Later on we were just watching the ocean and swimming around in the pool, when I got talking to 2 Aussie kids. I had been watching them surfing Shipwrecks and was consisering going out too, but there wasn't much light left and they had come in - I didn't fancy being out there alone. Turns out the reason they had called it a day was because they both saw a shark of some sort, and it bumped one of them on the leg! They told us that a chick had also seen it while surfing out there that morning, and been scared back to the beach too. One of them also told us about his Dad; He had been diving with a Marine Biologist he knew over by Playgrounds sometime recently, and a huge Hammerhead had swam past. Apparently Havnt taken photos and documented it, they think it was about 6m long!! Later on we went to my favourite place next door for dinner, which lived up to expectations. We also met Captain Blank (Mantaray man from last time) and organised a trip for the next morning. 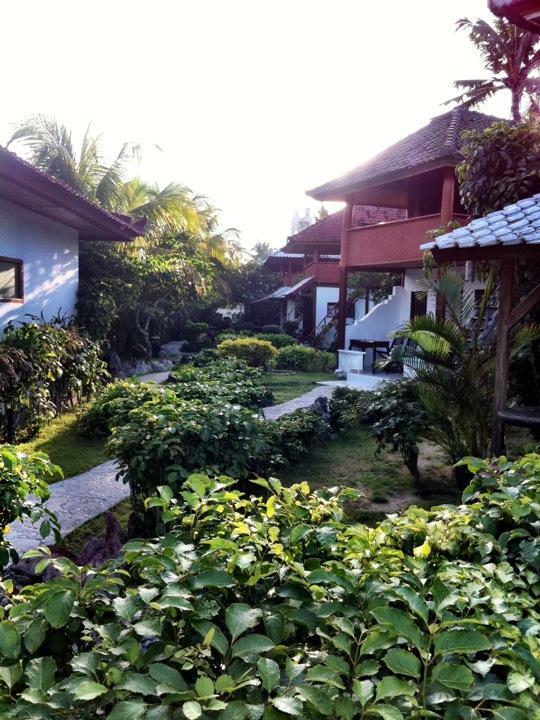 (Photo - Our Homestay place in Lembongan).